International Journal of Research in Health Sciences,2015,3,1,165-168. 1-M.D (pathology), Senior resident. 2-M.D (pathology), Associate Professor. 3-Junior resident in pathology. 4-M.D (pathology) , Professor and head of the department, ESI-PGIMSR and Model Hospital, Andheri (East), Mumbai, Maharashtra, INDIA. We are reporting a rare case of giant cystic leiomyoma causing diagnostic dilemma of confusion for clinician, radiologist as well as pathologist. A thirty three year old female presented with history of pain and distension of abdomen since one month with reduced appetite and frequency of micturition. She was taking treatment for hypertension and diabetes since one year. Sonography and CT examination showed a large cystic mass. The preoperative diagnosis of primary malignant ovarian tumor was made though all laboratory investigation including CA-125, CEA were within normal limit. The patient underwent exploratory laprotomy but there also organ of origin couldn’t be determined due to extensive adhesions. Removal of mass along with hysterectomy with bilateral salphingo-oophorectomy was done. The histology revealed benign spindle cell neoplasm which was confirmed as a leiomyoma with cystic degeneration on IHC. 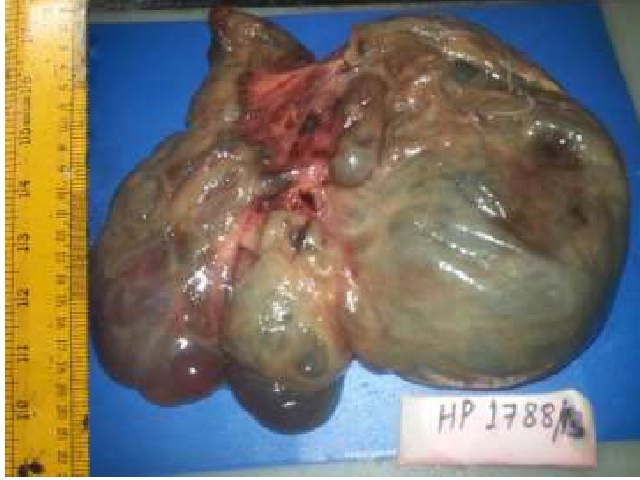 To conclude, while dealing with large intra-abdominal tumor differential diagnosis of the common fibroid should always be kept in mind when investigation are not correlating with size of tumor, so that extensive surgery in young age will be avoided.